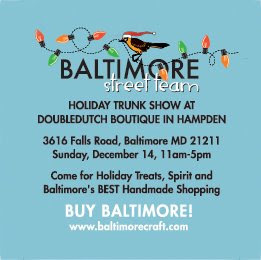 Shop local and get a last chance to purchase from BEST members at one of our favorite boutiques, doubledutch. There will be sweet treats to eat while you browse the wares. And when you make a purchase from a BEST member, you'll be entered in a drawing to win a $50 gift certificate to doubledutch! Give it as a gift, or treat yourself. Stop by this Sunday, December 14th, from 11am - 5pm. We'll see you there! doubledutch is located at 3616 Falls Rd, Baltimore, Maryland 21211, just off the Avenue.